A large family home with incredible views of the lake and mountains. The floor plate is made up of centralised dining and family room with a separate kitchen off the dining area. There is a separate lounge if you need a break from the kids or perfect for larger groups. If you do have your own car we have off street parking. In addition there are outstanding views looking out over Lake Wakatipu and you are surrounded by the magnificent Wakatipu mountains. Imagine sitting in the formal lounge with the open fire crackling be able to look at some of the best views available in Queenstown, a warm spacious home away from home. Upstairs bathroom is off the Master Bedroom with a separate toilet, down stairs bathroom has the shower over the bath and there is a separate toilet. Our home has a beautiful view of Lake Wakatipu from the lounge. We have views of the magnificent Remarkable's from our kitchen and also views of both Cecil and Walter Peak as well as the Skyline Restaurant and Gondola from the lounge and living area. There is a Heat Pump is in the Living area with heaters in all three bedrooms, bathrooms also have heaters. The open fire is located in the lounge with views out to Lake Wakatipu. We have a porta cot available on request. The house was great -- gorgeous views looking out over Lake Wakatipu. The layout was ideal for a family of 5, with the kids downstairs in the own bedrooms. The kitchen was well outfitted, and the owner was great to work with -- very helpful and welcoming. It was the perfect holiday in beautiful Queenstown. Great location. Big house with stunning views. Highly recommend. Only 10 minutes walk to town,so need for a car. Only 10 minutes walk to town,so need for a car. Incredible views of the lake and The Remarkables. Lovely open fire and comfortable beds and couches. We ended up using one bathroom due to plumbing. We are only an 8 minute walk (1km) from shopping, cafe's and restaurants in downtown Queenstown. There is a bus stop at the bottom of the hill which will take you to Frankton or Arrowtown, you can also catch the bus to the ski fields(subject availability), the main collection point to Coronet Peak & The Remarkables ski fields is about 10 minutes walk. 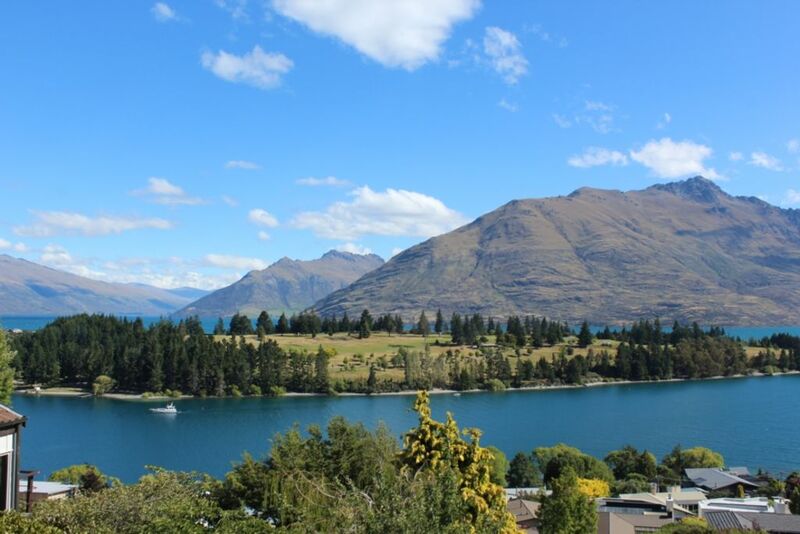 There are many attractions to do in the Queenstown area such as Jet Boating, Boat Cruises, Skiing, Walks, stroll around the Gardens, Luging at the Skyline, Parapenting , Bungy Jumping, Wine & Beer Tours, Golf just to name a few.